The Only Answer to Success contains a proven formula for changing your mind-set to that of a true “champion”. Based on thousands of hours of research and personal experience, Dr. Leonard Coldwell has come up with a proven way to retrain your mind to achieve any goal or get through any challenge with zero stress. He will systematically show you how to change the subconscious negative mind programming that is eating away your drive and enthusiasm.He will also help you counter the negative influences of family members, friends, coworkers, the government, the media, and other supposed well-wishers that do more harm than good. After applying Dr. Coldwell’s proven mind conditioning, you will retrain your mind to find success everywhere. You will be guided to success like a targeted missile. 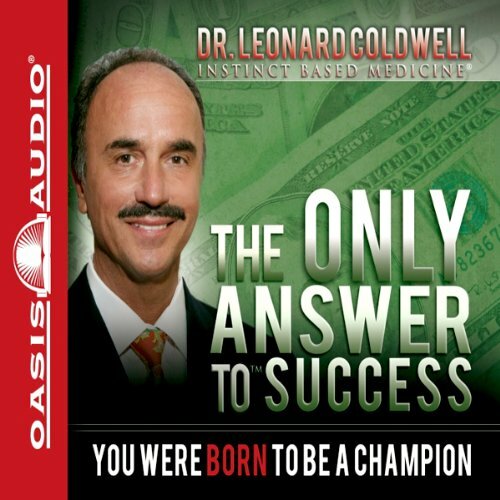 If you follow Dr. Coldwell’s proven approach, becoming successful is inevitable. You will truly have the only answer to success. "The only answer..." seems to be somewhere else! "The only answer to success" seems to be IBMS, not contained in the book and something else on sale by Dr Coldwell. I feel conned as I had to pay for a book just to listen to Dr Coldwell selling IBMS. In my view, in order to sell IBMS, NLP is now dangerous and hypnosis may lead to multiple personality disorder? Not much more than late night infomercials. If you have ever read or listened to &quot;Zig Ziglar&quot; you will find out that the author took a lot of liberty and lifted Zig Ziglar's material. Some are actually copied word to word. Some incidents that were actually happened to Ziglar were told as if they were Author's own experiences (The girl in Air Plane story and how she exclaims looking at the cockpit). I see that as dishonesty. Having said that there is some good information about the dendrites and how they work. Also expect a lot of promotion of his IBMS system. But the cons outweigh the pro's here . I will be returning this one. If you are a beginner to self development then this book has good insights. It contains just about every idea I've ever come across in one book. The pace is too fast and whilst it tries to go into depth, it fails. I did not finish listening to it but could not muster enough concentration to stay with it and the rather drab narration. Seems to be a bit of a sales pitch for their course also. I listen to this book again & again! Love the ideas. Thanks, Dr. Coldwell, for all of your insights. You will have to be a gin member to understand the language of the universe. The book will never work unless you make the decision to take action.... period.